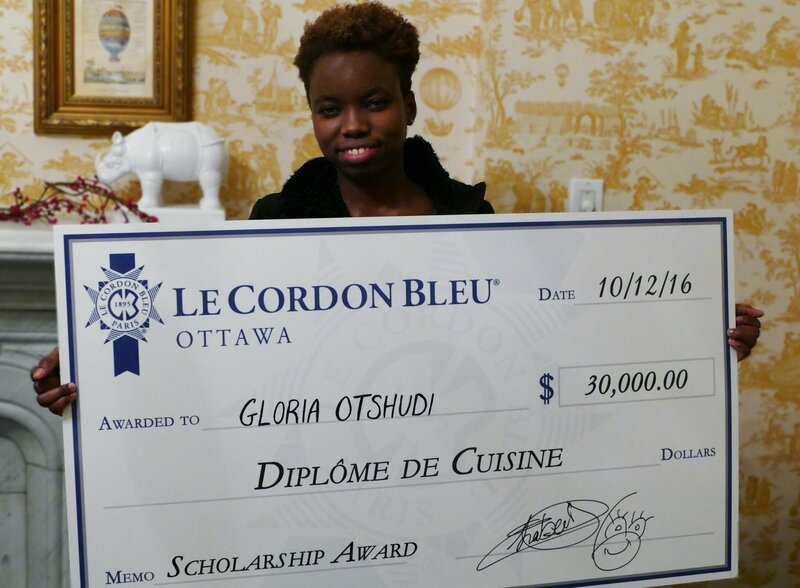 Gloria Otshudi has been crowned winner of the 2016 Passion for Excellence Chef Scholarship at Le Cordon Bleu Ottawa Culinary Arts Institute. The Diplôme de Cuisine scholarship valued at $30,000 CAD, includes a fully funded nine-month placement in the programme as well as a paid internship under the guidance of Executive Chef Yannick Anton of Signatures Restaurant. Gloria is the second winner of the scholarship, last year Amanda Coccimiglio from Vancouver, British Columbia won. Amanda is now in her first term of the Diplôme de Cuisine programme and sat on the judging panel for the final cook-off with Chefs’ Hervé Chabert, Aurélien Legué, Nicolas Jordan and guest judge, Oliver Bartsch. The scholarship was determined through a four-hour cook-off between Gloria Otshudi and Kevin Morin, that pushed the contestants to their culinary limits. Each contestants had to prepare a three-course French meal which included a starter of hard-boiled eggs with creamed spinach au gratin, a main course of scallops with red wine, served in their shell and a dessert of Iles Flottantes consisting of meringue floating on crème anglaise. The judges scored the dishes based on five components: presentation, technique, taste, hygiene and organization. The contestants later sat down with the judges and other guests over a four-course celebration dinner at Signatures Restaurant before announcing the winner. A very emotional Gloria was crowned winner of the 2016 Passion for Excellence Chef Scholarship with a large cheque in her name. The runner up, Kevin Morin received 50 per cent off tuition. 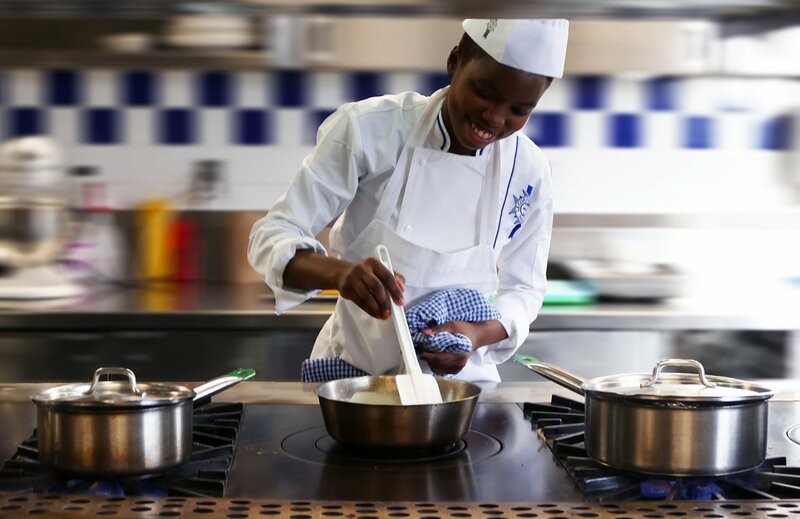 "Since cooking has always been my passion and the career I want to pursue, culinary school has always been in the back of my mind, but not just any culinary school Le Cordon Bleu was always the only school for me. However, I never thought I would be able to attend due to economical short comings, but when I found out that there's a scholarship competition I didn't hesitate to participate as this is a once in a life time opportunity" said Gloria. We would like to thank all our 2016 applicants for their participation and wish you each all the culinary success, for further information on our 2017 scholarships please click here. The scholarship is presented by Le Cordon Bleu Ottawa in association with Restaurants Canada and Canada's 100 Best Restaurants. Le Cordon Bleu Ottawa Culinary Arts Institute is Canada's only campus for Le Cordon Bleu. Every year, students from all over the world, representing more than 100 nationalities, attend our campus to share a common bond in their passion for pastry and cuisine.